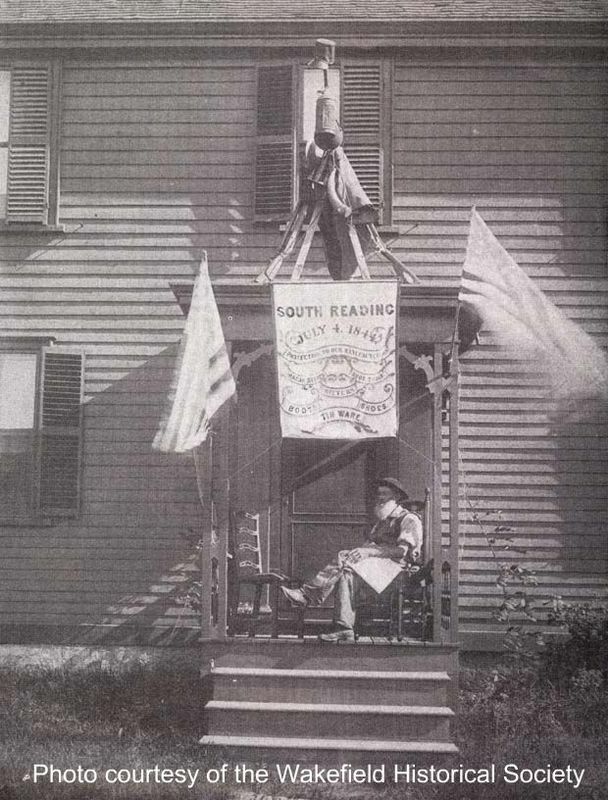 "This gentleman was captured by the photographer in 1889, under the South Reading town banner which was originally carried in the July 4th, 1844, birthday celebration. The banner reads, 'Protection to our manufacturers - razor straps (strops) - shoe tools - bitters - boots - shoes - tin ware.' The musket and powder horn were originally carried in the Revolutionary War, while it is claimed that the tin lantern was one of the lanterns which hung at the Old North Church on the night of April 18, 1775, for Paul Revere's signal to 'Ride and spread the alarm through every Middlesex village and farm.' The present Wakefield town seal was adopted in 1878." -- Text from calendar by Jayne M. D'Onofrio. “July 4, 1889,” NOBLE Digital Heritage, accessed April 20, 2019, https://digitalheritage.noblenet.org/noble/items/show/6994.